Please click here to return to comment 4 of the main paper. There are two of us in the building who are on this team, and you have generated some truly useful thoughts for us. We mostly truly liked the last note, great. But we were wondering what you mean by "what political path the US is likely to follow over the next ten years, and what effect that style will have on matters other than the domestic economy"? OK, it's election year and there are several styles on offer, but basically one model moves us to a more Canadian-European-Japanese model, and the other is kind of John Wayne, take charge of your own destiny, minimal government. This note analyses what we think is happening. The book is divided into three parts. In the first of these, Haidt reviews the large amount of experimental work that has been done how we make choices that have a moral dimension to them. It has been argued, from experiment, that specific dimensions of morality reside in equally specific areas in the brain, a sort of modern phrenology. (There are said to be five such core dimensions - cost-benefit, risk avoidance, reverence for authority, support for the in-group and the pursuit of purity.) This is disputed, but it is certainly clear that humans are innately wired to feel certain imperatives, and that wiring varies between individuals. What is certainly agreed is that there is a Systems 1 response - instinctive, carried out without thought, quickly and without effort and formed chiefly in our earliest childhood, as a mixture of wired predisposition and social training - and a Systems 2 reflex, which is is rational, deliberative, requiring mental effort and not at all automatic. Systems 2 thinking is open to influence by new evidence and ideas, System 1 is, for the most part, fixed. Haidt discounts both Systems 2 and the entire pantheon of moral philosophy, as little more than rationalisation of decisions already made. We are, he says, most prone to giving moral issues weight when our emotions are high, and when System 2 is not employed. Haidt notes that research shows virtually universally that Systems 2 gives contradictory results and leads to poor decision taking as measured by outcomes. You get better results if you decide on the basis of intuition, he says. In the second part of the book, Haidt shows his interest in sociobiology, and the impact of evolution on our social being and our brains. He derives six principles that aid group survival, and for which evolution will have selected. He suggests that "moral" reflexes are simply architectures built into us by evolution so as to favour the survival of the group over the individual, and to reduce selfishness and the scope for free rider. Universalist: moral and political principles should apply to everyone, everywhere. Exceptionalist: principles govern the relationship between our group and the rest, to our favour because we are right. Questions authority essentially on principle, rejects assertions made without evidence Reveres authority, regards questioning of asserted truth as an affront even if that "truth" is provably wrong. Haidt asserts that all humans are wired by evolution to lie on the right of this table. He evokes the principles of evolutionary biology mentioned earlier. As a thought experiment: which behaviour helps a group to pass on its genes? One, favouring my tribe and following the directions of its authority figures and its norms. Or two, thinking how interesting it would be to let those guys with spears past the walls to see if they have some interesting ideas? We must, therefore, be deeply conservative, at least with a small C.
There is a problem with this. There is only the most limited evidence that we genetically - as opposed to socially - inherit our moral prejudices. If we did, then we would almost certainly have acquired some of the characteristics that Haidt develops. But we might also have a bunch of 'contrary' genes, wiring that allows for experiment. In favourable moments, these could pay huge dividends. Population genetics holds what are called "polymorphisms" in many other traits - being visible to mates, but also not being visible to predators - and it would be foolish to think that we are not also interestingly mixed up in the same way. It is as important to evolutionary survival that some part of the group survive catastrophes as it is that most usually do reasonably well when the challenge is low. These pressures select for different things - flexible strategies on the one hand, uniformity and order on the other. There is, however, a great deal of overall truth in this classification. Since the end of World War II, the official ethos of America has been anchored to the left of this table but, nevertheless, the underlying reflex has been firmly on the right. Over the decades, however, the US political reality has, increasingly, become that of the liberal consensus. Conservatives sense a failure in ideology, and they want to reset the clock to a time when things seemed to work, everyone agreed, at least in public, to certain verities. A characteristic of that time was that the state was less interfering and less all-encompassing. State failures, and the integration of state and Big Business, are strongly implicated in the crisis. Ultra-liberal elements and many young people who are not naturally liberal sense a failure in the notion of the nation state as a thing apart, as a fortress for values and a single people; they feel disconnected from - threatened by or certainly abandoned by - the current economic model. One Occupy Wall Street participant summed it up, pointing at the cliff like buildings: "You can sorta guess what goes on in there, but it's like another world entirely, and we are shut out in the cold out here while they do God knows what." Similar views apply to "big" technology. This group are happy with the complex world so long as it works, but feel undermined when it does not, or shows itself for what it is. The disadvantaged see their world set to get worse. The welfare model is broken, the young are going to have to pay for the old, low skill jobs are either evaporating, getting worse paid and more demanding. The life trajectory of job-marriage-kids-house-friends-retirement is essentially gone in practice and going in terms of social imprimatur. They are bewildered and feel abandoned by their nation, to the extent of largely ignoring national or international news and politics and immersing themselves in closed worlds, such as games, closed social worlds, sometimes drugs and the open domain celebrity/music. sport nexus. This does not map onto the political parties at all well. 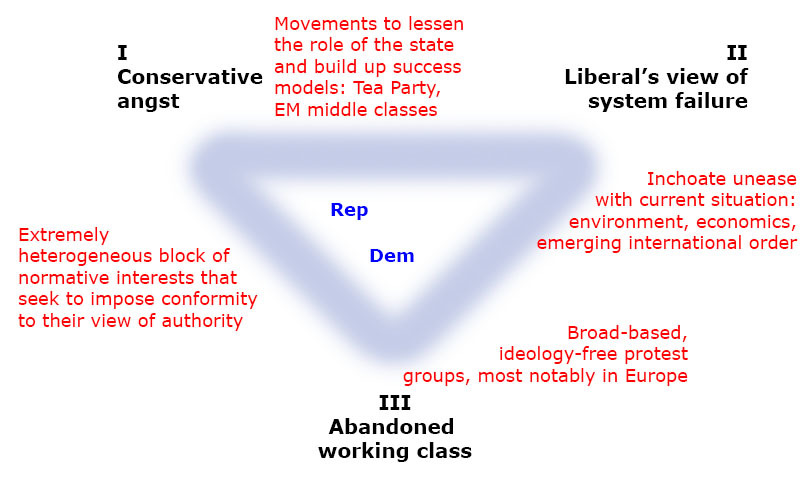 The figure shows the three elements that are discussed above are the points of the inverted blue triangle. Inside the triangle, the current parties try to cover all the bases, innately centrist and attempting to please their supporter base whilst offending no significant voting block. In red, we have the consequences of the interaction of the three dimensions that are given above. On the left, I + III gives us a range of views that feel betrayed, and want to impose their kind of normality onto society. At the top, I + some small element of II wants to restrict the role of the state, open society up to whatever divisions arise naturally within it and in general allow values to form around success, the immediate family and so on. This is a model that appears in the US as, for example,the Tea Party but it is the middle class norm in much of the emerging economies. It is not so much unconcerned with inequality as positively welcoming it as an economic stimulus. At the top right we find people influenced by a deep unease about "where we are going". They tend to be concerned about the environment, consumerism, educational standards and how international power and influence is brokered. They are educated and influential, but not numerous except amongst the young, who have in the past tend to grow into other concerns. It remains to be seen whether this group attains political power. At the bottom of the triangle, effectively represented by nobody, are groups who feel abandoned, alienated from their society. In Europe, these feel the full weight of the recession and welfare retrenchments, and are now abandoning general street protests for membership of authoritarian groups. These groups are non-rational, but extremely emotional. Many are recruited by the normative interests at the left of the figure. They have student hangers-on who sound off about Type II issues - "failure of capitalism" et al - but their true home is with the conservative column given in the table above, in which we find the authoritarian, blaming, identity-imposing attitudes that fit so very well with adolescent intellectuals. So, each of the parties has major links to some of these tendencies. The Republicans have moved sharply up and across the triangle towards I in the past few years. The Democrats are caught in a bind, in that their core supporter groups have views which if voiced will alienate much of middle America; and a claque of II-type attitudes which have the same effect. They are blurring out, rather than moving as a party. Republicans therefore increasingly represent a vocal minority whilst the Democrats properly represent nobody. There is nowhere on this figure that stands for a "whole nation" stance, in that all the forces are centripetal and away from the centrist consensus. This has got very long. For scenarios, US politics are not going to be "business as usual". Obama has managed to do anything much on the surface, while keeping the show on the road by mad paddling beneath. (No, not a swan of any colour.) But now people are sick of nothing seeming to happen - not having a worse crisis does not count. So they are probably going for action, either re-electing him and demanding - well, to do something; or going for the Republicans and a monstrous experiment. Neither will please even a majority, and like a zombie movie, there will be scrams ahead. To the outside world, the US finding a new balance and a new personality is going to look chaotic and risky.